From March 9 to April 1, Marina Bay Sands featured 22 sustainable light art installations created by artists all around the world for “i Light Marina Bay” around the Marina Bay waterfront. As Asia’s leading sustainable light art festival organized by the Urban Redevelopment Authority of Singapore, these installations reinforced the property’s position as a sustainable precinct. It also served as reminders to encourage festival-goers and the public to adopt sustainable habits in their everyday lives, a concept encouraged through Sands ECO360, Las Vegas Sands’ global sustainability program. Marina Bay Sands has been a key sponsor of the festival since 2012. As a prominent landmark in the Marina Bay area, the Integrated Resort is doing its part for the larger community by making art accessible to a wide local and international audience and helping to provide a platform for local and international artists to showcase their work. 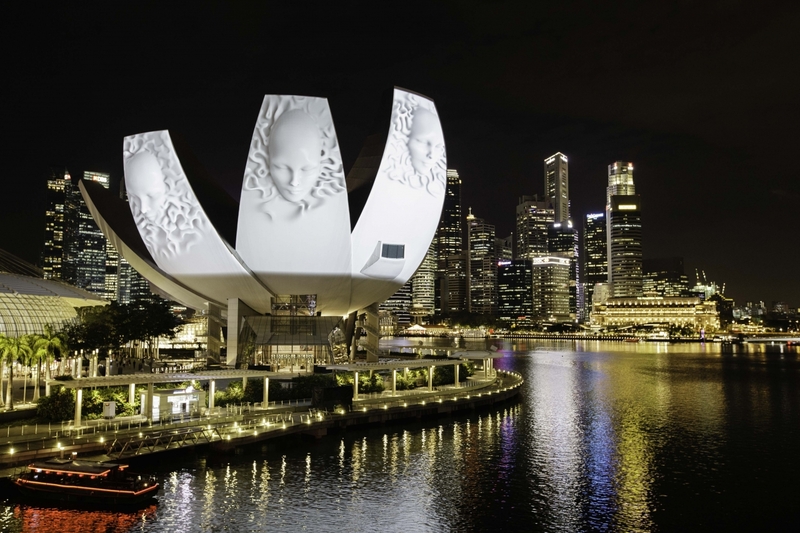 The ArtScience Museum has been a key highlight of the sustainable light festival, lending itself to become a perfect canvas for internationally-renowned projection mapping artists to showcase their light projection artwork. The 2018 festival featured “Evergreen” developed by Hungarian light art artist group, Limelight. The artwork used unique 3D animation content and advanced light map projection storytelling techniques to explore the relationship between sustainability and development in the 21st century. Beyond the showcase of visual art, the festival also featured an exciting line-up of program and activities for everyone including ILLUMI Bar, an LED-lit pop-up lifestyle space featuring furniture made with reusable plastic tanks. During the festival, the property also switched off non-essential lighting and turned up the air-conditioning temperatures to save energy in support of i Light Sustainability’s signature Switch Off, Turn Up campaign.